J. Geron was from Liberia. The name Liberia denotes “liberty” as freed slaves moved to Liberia in 1822, who founded the country in 1847 with the support of the Government of the United States creating a new ethnic group called the Americo-Liberians. However, this introduction of a new ethnic mix compounded ethnic tensions with the sixteen other main ethnicities. Since 1989, Liberia has been in a state of flux witnessing two civil wars, the First Liberian Civil War (1989 – 1996), and the Second Liberian Civil War (1999 – 2003). The musical heritage of Liberia includes several genres of pop derived that from countries’ neighbors like Ghana and Nigeria, most notably Highlife. Highlife is a musical genre that originated in Ghana and spread to Sierra Leone and Nigeria in the 1920s and other West African countries. It is usually characterized by jazzy horns and multiple guitars which lead the band. I have been unable to find any information about J. Geron. If you know anything about him please contact me. 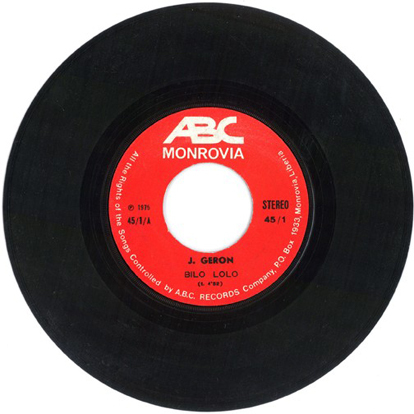 Catalog number 45 / 1 / A on ABC Monrovia of Liberia, released 1975. No other information available.